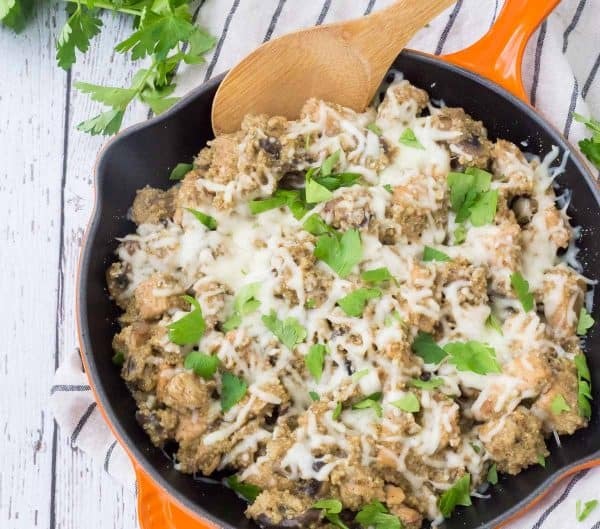 Creamy, comforting, and hearty, this one pan chicken quinoa marsala is a healthy and filling take on the flavors of chicken marsala. Best part? Only one pan gets dirty! If you’re looking for an easy, healthy, and hearty weeknight meal, look no further. It’s no secret that I’m growing tired of Michigan’s never-ending winter, despite the fact that I’ve lived here my whole life and couldn’t be more used to it dragging on and on and on. I’m eager for the days when we can walk to the end of the street to get E when she gets off the bus. I miss the days of walking behind N while he rides his little trike up the hill to the end of the street. Ninety-nine percent of the time, he has a cape on and it flies in the wind as he pumps his legs in circles as fast as he possibly can. It’s even cuter than you can imagine. For now, we sit in the warm car waiting for her. We play with Snapchat filters (I’m rachelcooksblog over there!) and he pretends he’s a pirate. He’s either a pirate or a superhero 75% of the day, so this is no surprise. “Mommy, take a picture of my pirate face!” After that, he usually kicks me out of the picture and asks me to take one of him by himself. Or one of him and his “yion” – his stuffed lion. And then he wants one of just his lion. After E gets home from school, the time just FLIES before we have dinner. I almost always have a package of boneless skinless chicken breasts in my fridge so a quick and easy meal like this one pan chicken quinoa marsala is super easy to make. And the best part is that after we finish eating, I only have to wash that one pan before moving on to lunch making, coffee prep for the next morning and then finally family time. One of Ben’s favorite things to eat is chicken marsala (see also chicken marsala dip and marsala roasted mushrooms!) so I wanted to incorporate those flavors into this dinner. 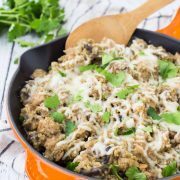 Meaty mushrooms and chicken make this hearty and filling, and of course the quinoa adds to the heartiness as well. It’s super filling and a well-rounded meal. Next time I make it, I’ll probably stir in some spinach or baby kale, because that’s just what I do. It’s perfect on its own, though. More one pan meals you’ll love! 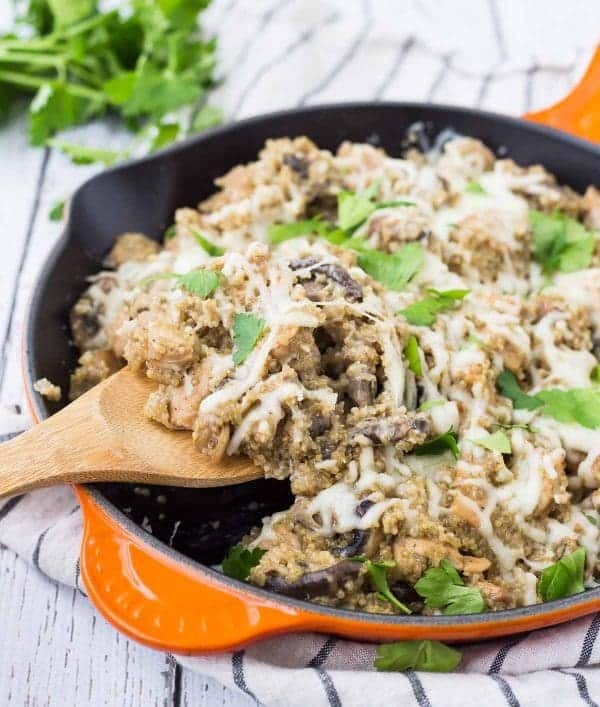 Creamy, comforting, and healthy, this one pan chicken quinoa marsala is a healthy and filling take on the flavors of chicken marsala. Best part? Only one pan gets dirty! In a large, deep skillet (with cover), heat olive oil over medium heat. Add chicken and season with salt and pepper. Cook until chicken is browned on all sides, stirring occasionally, about 5 minutes. Add mushrooms and onions and continue to cook, stirring, until onions are translucent and mushrooms are cooked. Add cooking wine, quinoa, and chicken broth. Bring to a boil, cover and reduce to medium low heat. Cook covered for 15-20 minutes or until tails have appeared on quinoa, stirring occasionally to ensure quinoa cooks evenly. Top with mozzarella and cover for 1-2 minutes or until mozzarella melts. 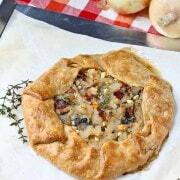 You may also put it under the broiler if you’re using an oven-safe pan. 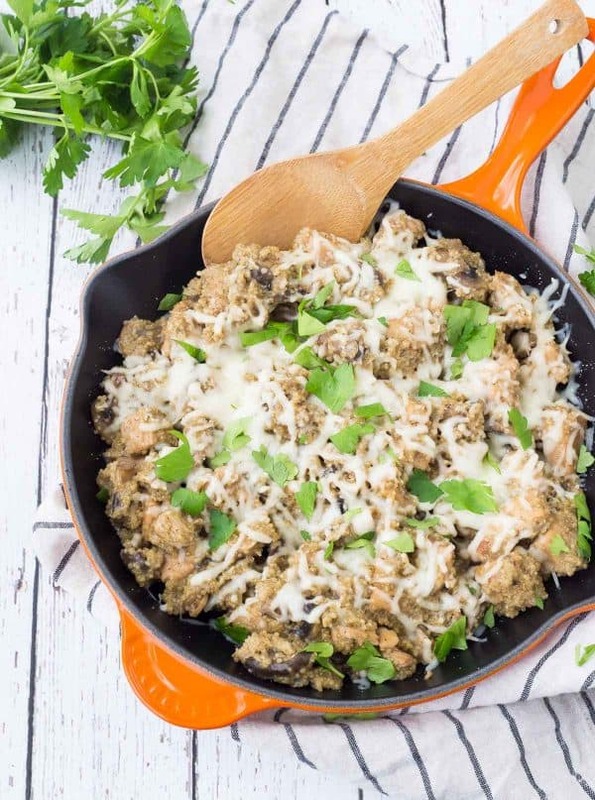 Verdict: I love this cozy and easy chicken quinoa meal – it’s a great one for busy weeknights! Husband’s take: The first time I made this, I added way too much thyme and we both thought it was gross. The next time was better! Changes I would make: None are necessary. 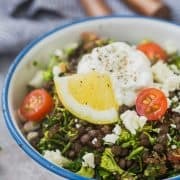 If you wanted to make this dairy-free, you could leave out the cream cheese and mozzarella and it would still be a delicious and hearty meal. My friend sent me this link saying that I should try it and I’m so thankful. 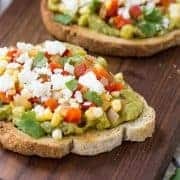 The recipe is delicious and I love how it’s so easy to prepare. Thanks! You think I could sub yogurt for cream cheese? Looks delicious! It will change the taste slightly but I think it will work! Make sure to turn the heat down to low before adding it, especially if you use low-fat or fat-free yogurt, to prevent curdling. 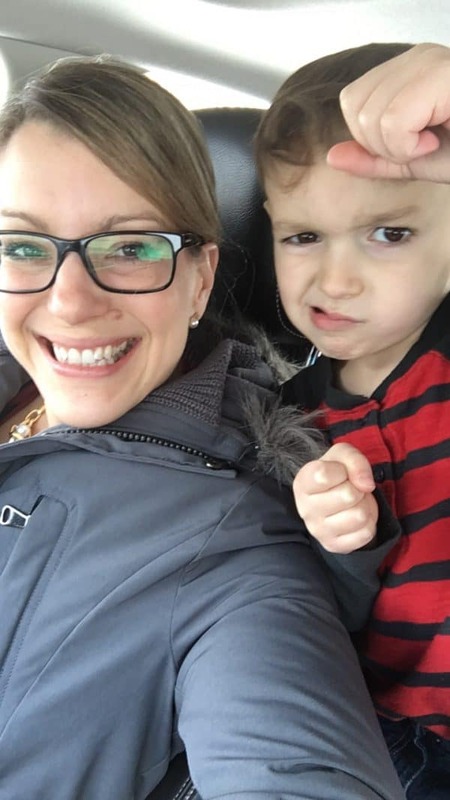 That picture of you two is the cutest! And I never get tired of one pan meals. Brilliant! I love one pan dinners and chicken marsala is always a winner. This looks fab! !